Antica Formula is the Italian vermouth par excellence. Each bottle is a faithful reproduction of the original in blown glass from the 18th century and a true mark of distinction and tradition. From the old Latin text ‘Tempus Judex’ that remains at the forefront, to the personal signature of the Chairman of Fratelli Branca Distillerie in the far right corner of the label, there is much to be told in every bottle of Antica Formula. Allow your eyes to navigate over each spot to discover the unique history behind this antique jewel. The story of Antica Formula started in 1786 in Turin, when Antonio Benedetto Carpano developed the recipe for the modern vermouth at his small wine shop in Turin. His knowledge from his studies as an herbalist lead to the addition of wormwood to an antiquated version of the drink, along with his unique mix of herbs and spices. Antica Formula’s unmistakable taste is the result of a strictly controlled production process, prepared according to a recipe originally founded in 1786. Selected wines from Italian grapes are processed with herbs chosen from around the world for their excellence. These include vanilla beans from Madagascar, Papua New Guinea and Tahiti, precious saffron mainly from the plateau areas in Iran, and wormwood from the Alps of Piedmont. They are carefully extracted and refined for up to several months in a process that infuses and intensifies the flavours, to create the authentic taste of Antica Formula. A journey through the unique nuances of history over the course of four centuries. Giuseppe Bernardino Carpano, the nephew of Antonio Benedetto Carpano, established the ‘Fabbrica di Liquori e Vermut’ in 1820, paving the way for the transformation of Antica Formula from being a small wine bar product to become the preeminent aperitif and Turin’s favourite drink by the late 1880s. Since 1786, Antica Formula has been an example of Italian mastery and heritage. The original recipe created by Carpano is valued and preserved by Fratelli Branca Distillerie and still today, like the ancient tradition, there are only three people who know the secret recipe. Antica Formula is a rarity. 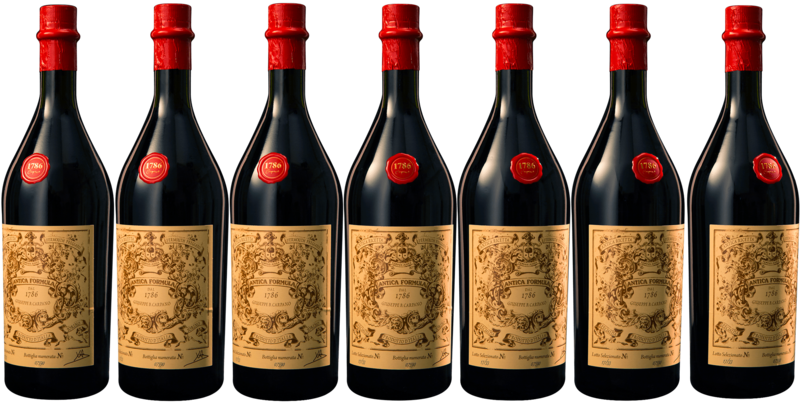 Produced in limited quantities around 25,000 pieces each, every small batch of Antica Formula is a result of rigorous controls along the entire production line, and is sold in highly prized bottles that are individually numbered. Every bottle of Antica Formula boasts the signature of Niccolò Branca, the Chairman and CEO of Fratelli Branca Distillerie – a sign that it has successfully passed all the stages of the carefully controlled production line and the highest standards of quality.